Xargo builds and manages "sysroots" (cf. rustc --print sysroot). Making it easy to cross compile Rust crates for targets that don't have binary releases of the standard crates, like the thumbv*m-none-eabi* targets. And it also lets you build a customized std crate, e.g. compiled with -C panic=abort, for your target. The rust-src component, which you can install with rustup component add rust-src. But we also have binary releases for the three major OSes. xargo has the exact same CLI as cargo. xargo will cache the sysroot, in this case the core crate, so the next build command will be (very) fast. By default, xargo will only compile the core crate for the target. If you need a bigger subset of the standard crates, specify the dependencies in a Xargo.toml at the root of your Cargo project (right next to Cargo.toml). You can compile a customized std crate as well, just specify which Cargo features to enable. If you'd like to know what xargo is doing under the hood, pass the verbose, -v, flag to it. + "cargo" "build" "--release" "--manifest-path" "/tmp/xargo.lTBXKnaUGicV/Cargo.toml" "--target" "thumbv6m-none-eabi" "-v" "-p" "core"
+ "cargo" "build" "--target" "thumbv6m-none-eabi" "-v"
Oh, and if you want to use xargo to compile std using a "dev" rustc, a rust compiled from source, you can use the XARGO_RUST_SRC environment variable to tell xargo where the Rust source is. NOTE This also works with the nightly channel but it's not recommended as the Rust source may diverge from what your compiler is able to compile as it may make use of newer features that your compiler doesn't understand. Xargo uses the same custom rustc flags that apply to the target Cargo project. So you can use either the RUSTFLAGS env variable or a .cargo/config configuration file to specify custom rustc flags. At some point you may want to develop a program for a target that's not officially supported by rustc. Xargo's got your back! It supports custom targets via target specifications files, which are not really documented anywhere other than in the compiler source code. Luckily you don't need to write a specification file from scratch; you can start from an existing one. One of the things you'll definitively want to do is drop the is-builtin field as that's reserved for targets that are defined in the compiler itself. Apart from that the only modification you would have to in this case is change the env field from gnu (glibc) to uclibc. Once you have your target specification file you only have to call Xargo with the right target triple; make sure that the specification file is the same folder from where you invoke Xargo because that's where rustc expects it to be. Your build may fail because if rustc doesn't support your target then it's likely that the standard library doesn't support it either. In that case you will have to modify the source of the standard library. Xargo helps with that too because you can make a copy of the original source -- see rustc --print sysroot, modify it and then point Xargo to it using the XARGO_RUST_SRC env variable. This will compile an intermediate sysroot, the stage 0 sysroot, containing the std crate, and then it will compile the test crate against that intermediate sysroot. The final sysroot, the stage 1 sysroot, will contain both the std and test crates, and their dependencies. Xargo won't build a sysroot when used with stable or beta Rust. This is because std and other standard crates depend on unstable features so it's not possible to build the sysroot with stable or beta. std is built as rlib and dylib. The dylib needs a panic library and an allocator. If you do not specify the panic-unwind feature, you have to set panic = "abort" in Cargo.toml. What this flag means is that every program compiled with this libstd can only use the system allocator. If your program tries to set its own allocator, compilation will fail because now two allocators are set (one by libstd, one by your program). For some further information on this issue, see rust-lang/rust#43637. It's recommended that the --target option is always used for xargo. This is because it must be provided even when compiling for the host platform due to the way cargo handles compiler plugins (e.g. 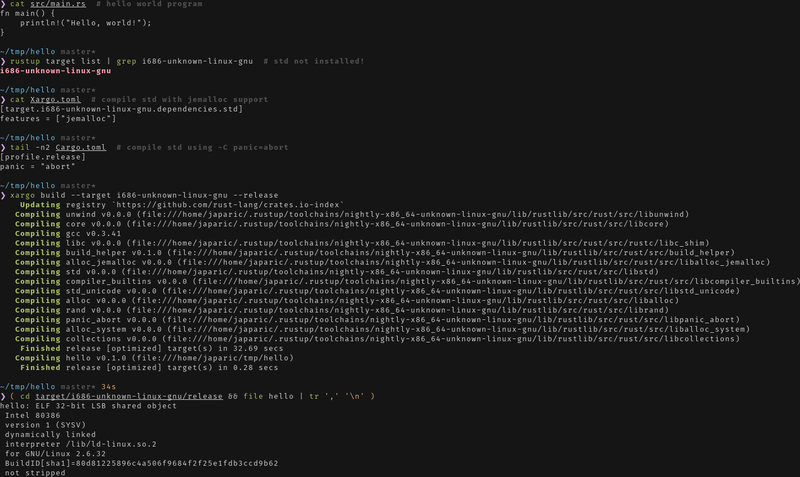 serde_derive) and build scripts (build.rs). This also applies to how all of the dependant crates get compiled that use compiler plugins or build scripts. You can determine your host's target triple with rustc -vV. On *nix, the following rune will extract the triple: rustc -vV | egrep '^host: ' | sed 's/^host: //'. Remember that both core and std will get implicitly linked to your crate but all the other sysroot crates will not. This means that if your Xargo.toml contains a crate like compiler_builtins or alloc then you will have to add a extern crate compiler_builtins or extern crate alloc somewhere in your dependency graph (either in your current crate or in some of its dependencies).